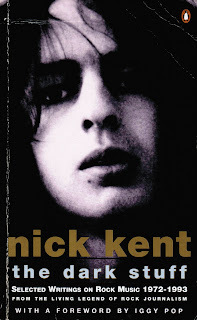 The book is a collections of Nick Kent's writings on Rock and Roll before the drug monster took over his life. I believe personally that Stanley Booth has written the greatest book on Rock and Roll, - Adventures With The Rolling Stones - but, this is the consistently best writing on a number of different bands and rock folk that you are ever likely to come across. There are articles on Brian Wilson, The New York Dolls, Jerry Lee Lewis. The stand outs for me are an interview with Miles Davis, an interview with Neil Young and the Brian Wilson piece, all absolutely superb. These are that well written that even if you are not into music or music writing they will entertain on a grand scale. The Miles Davis interview is simply brilliant, it catches the personality of the man as I have seen him on film to a tee. Great great writing. The only subject I feel had the better of him was Jerry Lee Lewis, who is mad anyway, but its still a good interview. And the good news is that Monsieur Kent ( he lives in Paris) has cleaned up and has just had published a memoir of the 1970's - Apathy for the Devil. Looking forward to that as well. Rock on.